Questo numero monografico è dedicato all’Etica delle Virtù. La prima sezione è presentata dai principali esponenti delle correnti in cui oggi l’etica della virtù si articola, successivamente discussa da studiosi che si misurano con alcuni dei suoi snodi più problematici. La seconda sezione del fascicolo tratta temi centrali dell’Etica delle virtù e della tradizione che la sottende. Nella terza parte ci si sofferma su alcune critiche rivolte ad essa o ad alcune sue correnti. The present special issue is devoted to Virtue Ethics. 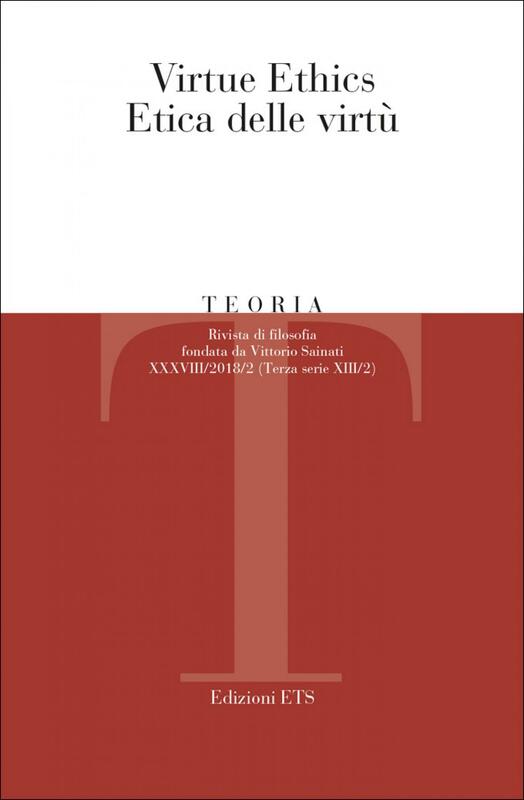 In the first section the Virtue Ethics is presented directly by the most notable representatives of its main trends and discussed by scholars who are trying to address (and assess) some of its crucial assumptions. The second section discusses some key issues within the virtue-ethical debate and the tradition underlying it. The third section hosts some critical voices of Virtue Ethics or of some of its trends. Scritti di / Essays by: Angelo Campodonico, Maria Silvia Vaccarezza, Julia Annas, Giacomo Samek Lodovici, Michael Slote, Christine Swanton, Linda Zagzebski, Howard Curzer, Franco Manti, Mark Alfano, Lorenzo Greco, Michel Croce, Andrea Pace Giannotta. Professor Annas, you are very well known in continental Europe, and particularly in Italy, for your works on ancient philosophy, most of which are available in translation and extensively studied. Could you tell us how and why at some point you turned to virtue ethics, and proposed your own original theoretical proposal? What are the cornerstones of your virtue-ethical approach, and which of your own works do you think are crucial to it? What are in your view the main challenges virtue ethics has to face these days? Elizabeth Anscombe is an Aristotelian, but her insights allow one to make a better case for moral sentimentalism. The sentimentalist tradition emphasizes both the empathic and the active sides of compassion, benevolence, and other such sentiments, but hasn’t previously allowed us to see how these two aspects of the moral sentiments necessarily work together. However, Anscombe’s idea that one cannot simply desire a saucer of mud allows the sentimentalist to argue that compassion, e.g., as a motive cannot exist all on its own but requires empathic feeling. It can also be argued that empathy doesn’t merely lead to compassionate motivation but entails it. The two sides of compassion are necessarily tied together, and the paper ends by showing us how we might more deeply understand such a moral sentiment and others in terms of the traditional Chinese idea of the necessary complementarity of yin and yang. There is much debate about what virtue ethics is as a type of contemporary moral theory. This question is addressed by distinguishing eudaimonistic virtue ethics (in contemporary forms) in terms of which virtue ethics as such is often defined, from Target Centred Virtue Ethics. This form comprises two main theses: a target centred account of what makes a trait of character a virtue and a target centred account of right action. Target centred virtue ethics is given a partial defence in this paper. Part of this defence involves getting clear on what are the presuppositions of contemporary eudaimonistic virtue ethics, for these may be more or less controversial. Another part discusses the problems of indirection and egoism faced by eudaimonism, and the target centred virtue ethical response. This paper summarizes my new moral theory, which is based on direct reference to exemplars of goodness, identified through the emotion of admiration. Since a motivating emotion is at the root of the theory, it is intended to serve both the theoretical purpose of mapping the main moral terms by reference to features of exemplars, and the practical purpose of making us want to act morally and showing us how to do so through emulation of exemplars. The theory links the a priori side of ethics with empirical work in psychology and neuroscience, and it gives narratives a key function in the theory. Since it tracks a natural process of moral development in the emulation of exemplars, it also connects with moral education. Right now many countries seem quite divided about justice. Since the two sides hold incompatible principles, at least one side must be holding the wrong principles. To have bad principles, and to feel and act upon them reliably without regret or reconsideration, is vice. Yet we all know people on both sides of the political divide whom we consider virtuous. This poses a challenge for virtue ethics. How can people with bad principles of justice be good people? An invaluable resource for correcting the limits of deontological and consequentialist theories, is given by the Aristotelian idea of φρόνησις (phronesis) or moral judgement, because it helps to free moral decision from standard rules and principles and to give contextual justification. It is a very important intuition that, however, has to be re-thought in the light of pluralism and heterogeneousness and complexity of morality. Therefore, I propose a theory of the moral decision able to see the judgement as the expression of a plurality of factors that our moral imagination organizes and composes. In this sense, it is possible to intend the moral judgement as as an expression of ethical competence. Virtues are dispositions that make their bearers admirable. Dispositions can be studied scientifically by systematically varying whether their alleged bearers are in (or take themselves to be in) the dispositions’ eliciting conditions. In recent decades, empirically-minded philosophers looked to social and personality psychology to study the extent to which ordinary humans embody dispositions traditionally considered admirable in the Aristotelian tradition. This led some to conclude that virtues are not attainable ideals, and that we should focus our ethical reflection and efforts more on jerry-rigging our environments than on improving our characters. Most virtue ethicists resisted this reorientation. However, much of the scientific evidence on which the controversy was based has failed to replicate, raising the question of how much faith we should place in methodologically suspect studies. In this paper, I assess the state of the debate and recommend best practices for a renewed interdisciplinary investigation of virtues and vices in which philosophical expertise related to conceptualization and theorizing is essentially intertwined with scientific expertise related to operationalization, measurement, and statistics. This paper explores the educational implications of Linda Zagzebski’s recent Exemplarist Moral Theory. It purports to do so by comparing what I consider to be the basics of an exemplar-based educational approach with the standard approach to virtue formation, as it has been proposed by Steven Porter. After introducing four traditional strategies for fostering virtue formation in the young, I briefly summarize Zagzebski’s view and shed light on the educational principles that the view entails. Then, I discuss some common features and relevant differences between an exemplar-based educational approach and the standard approach. Finally, I attempt to defend both views against a couple of recent objections.